In 2005, MIT Professor Nicholas Negroponte founded One Laptop per Child, a non-profit organization dedicated to bringing low-cost, low-maintenance laptops to children in developing countries in an effort to enhance children’s education. The XO laptops (pictured left) are built for the wear and tear of daily use by children – they are waterproof, built of plastic and run on low electricity. OLPC operates on five core principles, which are listed in their promotional video: Kids get to keep the laptops, focus on early education and target six-eight year olds, whole classrooms and schools receive XOs at the same time, kids have a connection to the internet, and the availability of free software for the laptop to adapt to the needs of the child. In most cases, XOs are sold in large quantities to either governments or schools, so they can be distributed the way normal textbooks would be. However, individuals can also donate XOs by going to www.amazon.com/xo. OLPC laptops are designed to be community-driven. Children are given laptops, rather than desktops, for their mobility. Children can take their XOs home and share what they’ve learned with their family. In addition, since each XO comes with built-in wireless, any XO computer near another can connect together so children can share files and collaborate on projects easier. So how does the XO compare to a standard PC? XOs are built to function in remote, less developed areas and be operated by children. XOs have a dual screen – they can either display in full color or a black and white mode, which uses a darker screen in order to be readable in bright sunlight. This function is important because many children who receive XOs go to school outdoors. XOs use about 4 watts, compared to the 40 watts used by regular computers. They are the size of a small textbook, and low powered, so if traditional electricity isn’t available then the XO can be powered by alternative sources, such as solar, wind, water, generators, or human power. Although XOs have less power and speed than more traditional computers, they still satisfy the educational needs of young children. OLPC’s most recent venture is in creating the XO-3, a tablet computer. In July 2010, Indian Minister Kapil Sibal unveiled their plan for creating a $35 tablet computer, partly in rival to OLPC’s XOs. In response, Negroponte sent an open letter of approbation and advice (mostly explication of OLPC’s 5 core principles), encouraging Sibal to send a team of collaborators to MIT and OLPC. Negroponte’s letter begins with his invitation: “Please consider this open letter OLPC’s pledge to provide India with free and open access to all of our technology, and our experience with 2 million laptops, in over 40 countries, in over 25 languages. As a humanitarian and charitable organization, we do not compete. We collaborate, and invite you to do so, too.” Although OLPC had previously troubles with a need to dominate the market in cheap, education-oriented laptops, this letter demonstrates their switch to a more collaborative approach. They are now formulating their new tablet computer with the help of Marvell, who has introduced a more refined version for American schools with their campaign Mobylize. 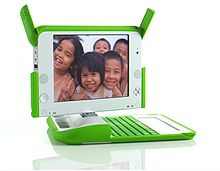 The XO-3s should be available by 2012 for a little under $100, the original goal for an affordable OLPC computer.